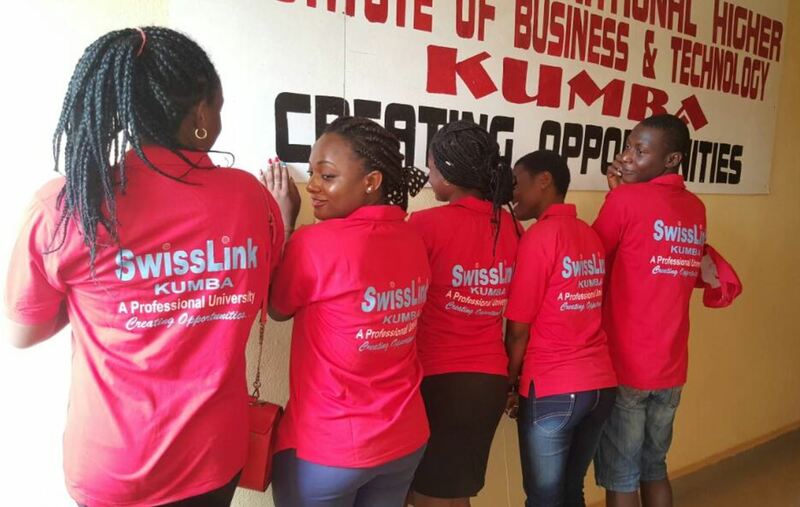 We are truly delighted to welcome you to SwissLink Higher Institute of Business and Technology, Kumba. SwissLink – A Professional University opens its doors to HND students in Business, Technology & Engineering, and Education related disciplines. We are based in the commercial Town of Kumba (SWR) Cameroon. 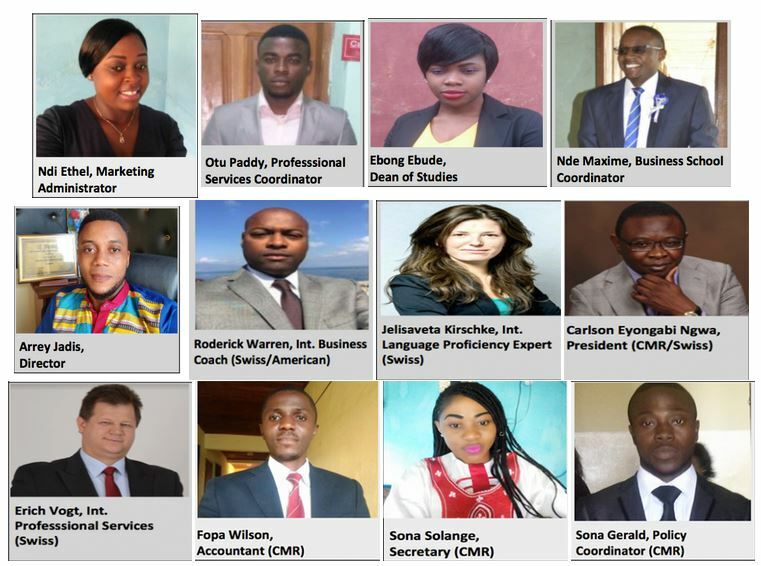 We offer a wide range of courses leading to International and Local (Ministry of Higher Education in Cameroon) qualifications. Our campus is located in the city of Kumba (Opposite Telcar Cocoa, Phone & WhatsApp: 677 625 658 / 679894892 ). The city of Kumba is a road Junction town in the South West province Cameroon and it is the main commercial town in Anglophone Cameroon. We employ local and international staff who focus on education and community engagement activities. Our engagement strategy includes caring for the underprivileged, the upliftment of people and assisting those in need in the form of scholarships and grants. Our staff works solely to empower students to achieve their full potential, which is a prerequisite to creating opportunities. 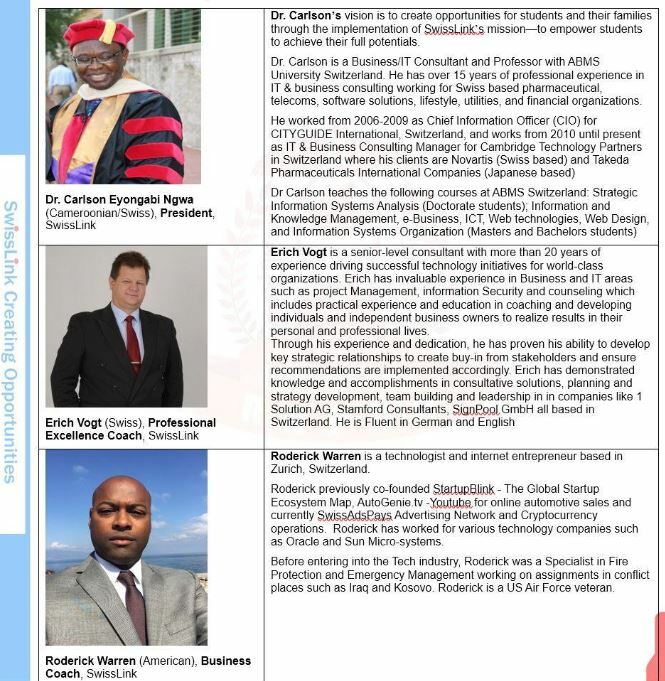 The President of the School, Dr. Carlson Eyongabi Ngwa, a Business/IT Consultant and Professor (Open University of Switzerland) based in Switzerland, aims to blend Swiss and Cameroonian academic and professional practices to offer students a unique experience. See an Interview with Equinox TV on ICT in Cameroon. One of our key focus is the economic and social development of the community. In our quest to promote knowledge and technology, our goal is to provide the market with a career-focused workforce. We also aim at making a significant contribution to creating sustainable economic growth that will impact the standard of living in the South-West Region and the entire nation in general. The education we offer focuses on entrepreneurship and creates opportunities for students to become job creators and entrepreneurs through the stimulation of innovation and creative thinking. We strive to be a leading institution, viewing the diversity of our staff, students, and other stakeholders. We are committed to ongoing transformation to make Education, Business, and Technology more responsive to the needs of the community. Empowering students to achieve their full potentials.